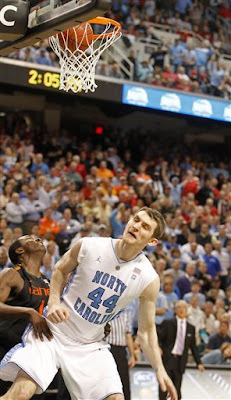 Zeller just after making the winning bucket. NORTH CAROLINA 61, MIAMI 59 – Well…No. After being down 19 points in the first half, top-seeded UNC staged a furious comeback that almost rivaled Miami’s amazing comeback yesterday from 10 points down with under a minute to play. This time, Tar Heel point guard Kendall Marshall penetrated into the lane and found Tyler Zeller for a layup at the buzzer that lifted North Carolina over the Hurricanes in Friday’s quarterfinals of the ACC tournament. Zeller, who earlier in the day had been acknowledged with the 2011 Skip Prosser award, celebrated with 13 points for the Tar Heels (25-6), who escaped the upset with a frantic comeback in the final eight minutes. North Carolina struggled with turnovers all day against Miami’s zone defense and didn’t get much going inside. The team rallied with a flurry of three-point shots before Zeller gave the Tar Heels their only lead on the final play. The ninth-seeded Hurricanes (19-14) were stunned when officials immediately ruled Zeller’s basket beat the horn, denying Miami another last-second victory. North Carolina went on a 27-6 run that included 11-of-17 shooting, five 3-pointers and eight consecutive points by Zeller to cap the game. It was North Carolina’s biggest comeback in a game in five years, dating to when the Tar Heels rallied from 20 down in the first half to beat Georgia Tech in 2006. Harrison Barnes had 18 points and hit four of the Tar Heels’ 10 three-pointers, seven coming in the second half. Leslie McDonald added 11 points and hit three threes as part of a smaller lineup that finally got the Tar Heels going after a sluggish first 30 minutes. The Tar Heels advanced to Saturday’s semifinals to face the Boston College-Clemson winner. Hey! Look what we found - the winning basket! North Carolina shot 56 percent and had just five turnovers following the break after committing 15 in the first half. The Hurricanes capitalized on those miscues all day, but the Tar Heels—who had struggled with their outside shooting for much of February—finally built some momentum with a series of four 3s in a 2-minute span to cut a 16-point deficit to 55-51 with 5:13 left. Zeller tied the game on a hook shot in the lane with 45.3 seconds left, then Miami gave it back to the Tar Heels when Adrian Thomas couldn’t handle a pass from Malcolm Grant and fumbled the ball out of bounds with 18.6 seconds remaining. 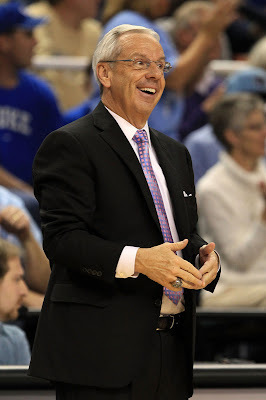 The Hurricanes had committed just four team fouls to that point, so they fouled twice to take North Carolina out of rhythm in the waning seconds. Finally, Marshall took an inbound pass with 5.6 seconds left and drove by Julian Gamble in the lane before sending a short pass over to Zeller on the other side of the block. Grant scored 16 points to lead the Hurricanes.